The COCOAMODA drive today was fantastic. Rain threatened, but it held off, except just a few sprinkles, and the overcast skies made for pleasant temperatures in Calvert, Texas. The town is small and quaint, but a few of us scored goodies from a table set up by a local organic farmer. We saw him pull in and set up his table and just had to check out the Texas homegrown goodness. A nice gift shop and a couple of antique shops were open and browsing was fun. There were plenty of places to get out of the sun beneath the awnings which covered most of the sidewalks along Highway 6. This is just the kind of town I remember growing up in North Texas and there are more of these kinds of towns in Texas than there are giant metroplex areas. There was MORE THAN enough off street parking on the street next to COCOAMODA and we lined up the vehicles for a nice photo op. A few owners, including an early adopter’s signature red Model S lined up out on Highway 6 in front of COCOAMODA for a really nice photo treat. Today's event saw not one, but TWO early signature RED Model S's, one from North Texas Club and one from the Houston Club. What a treat and how unusual to see two of them loose in the wild, in the same location. An added bonus was a North Texas member arrived in his fairly new Model S-P100DL and he took Chef Ken for a spin that the good Chef will never forget.....BAM! I believe almost everyone in the Tesla group had townspeople, out for a Saturday errand, stop by and ask questions about our vehicles and they were genuinely interested. I really enjoyed talking to George L. who had a 90 acre spread west of town and had lived around there all his life. His wife really liked the fact that the frunk had extra storage space! I only encountered one person who drove by in a big 4WD truck and honk like he was making a negative statement...but we all just waved. So, yes, we had 18 Teslas, including 2 Model X's and 40+ people from North Texas, Austin area and Houston area, driving their $80-$130K+ vehicles, parking on the street, having lunch and visiting, without incident or fear of vandalism. So in spite of all the propaganda, it was a great experience and a nice day for a drive in the country. Thank goodness we did not have to endure a hay ride into town as previously suggested by some negative Nellie who thought the trip would be a laughable disaster. Chef Ken Wilkinson and his lovely wife, Jacqueline arrived and we had a photo op with them. They are a genuinely lovely couple and they are taking each day as it comes, in his long road to recovery. But let me tell you, Chef Ken has a firm and sturdy handshake, a big smile and twinkle in his eye. We had a good visit with both of them and I, for one, could feel the love they have for one another. Jacqueline gave her testimony as a wife whose husband was critically injured, in a coma for 60 days and did not even recognize her for many months after awakening. 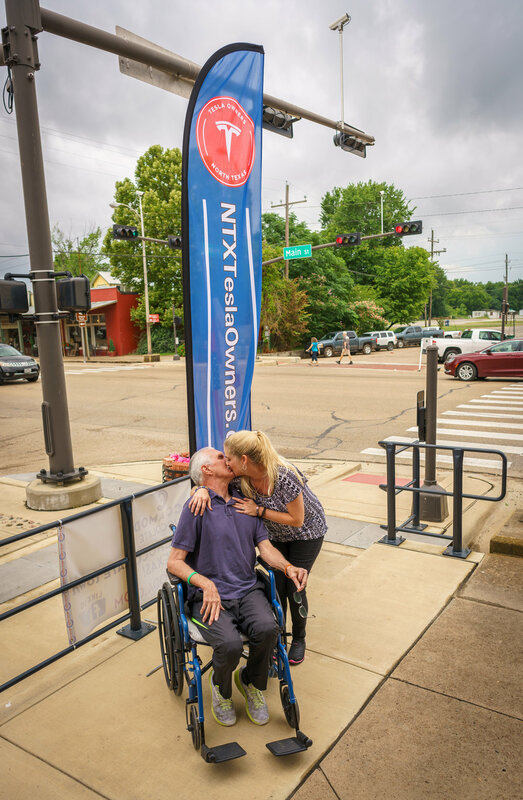 She described the long road to recovery and the journey is not over yet. There was not a dry eye in the room. They were gracious hosts to our group and so grateful for the donations made to the Chef Ken fund. Our entire group was accommodated inside of COCOAMODA for lunch, which included yummy handmade truffles in the restored 1870's bank building. The truffles in the display case were disappearing by the dozens as people purchased them to take home. One of our members discovered that there is actually some charging infrastructure (NEMA 14-50) at Main and Burnett Street. So now, by adding it to PlugShare, COCOAMODA-Calvert, TX is on the PlugShare map. Thanks so much Logan Boyd, Thomas Knowles, Rick and Leesa Bollar, Frank Miragliotta and others for the awesome photos. 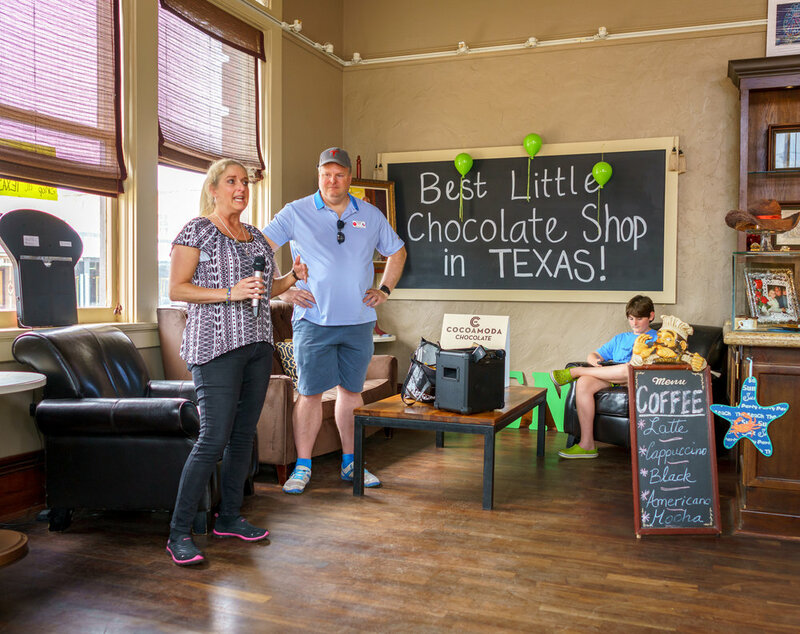 The Tesla clubs in Texas invite all Tesla owners to converge in Calvert, Texas to socialize, have lunch and enjoy the Best Little Chocolate Shop in Texas! COCOAMODA is a Texas-based gourmet chocolate business. 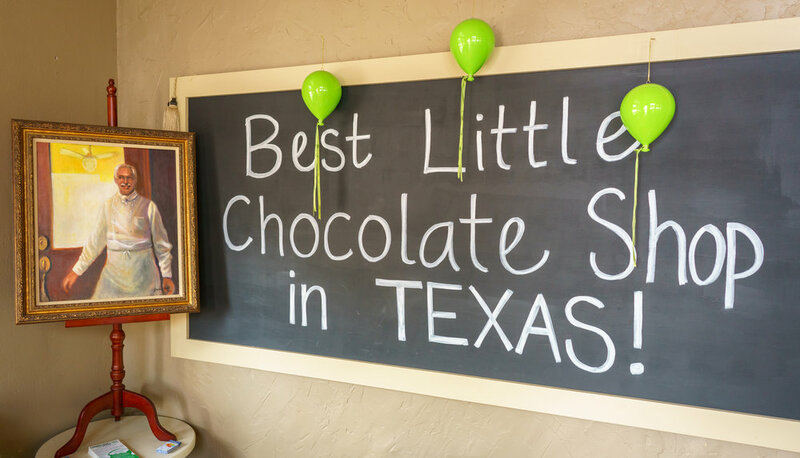 They operate out of the historic town of Calvert, Texas on Main Street (Highway 6), where they create their chocolates and have a chocolate boutique. Their mission is to continue to produce the highest quality truffles and confections using the finest grade of chocolate and freshest ingredients sourced from across the globe. 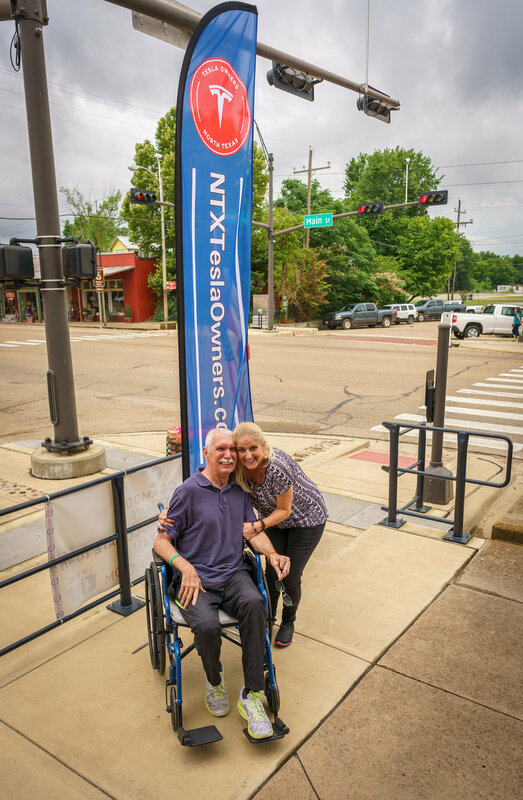 A little more than a year ago, Chef Ken Wilkinson sustained a traumatic brain injury. 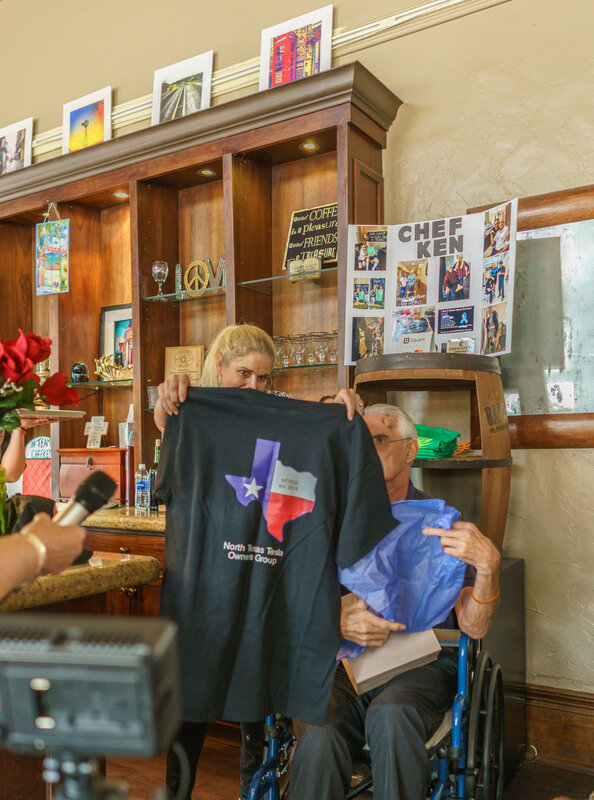 While he continues to heal and recover, their gourmet restaurant is put on hold, but his wife Jacqueline continues to produce the best chocolates in Texas! Proceeds from this event benefit the Chef Ken Fund!